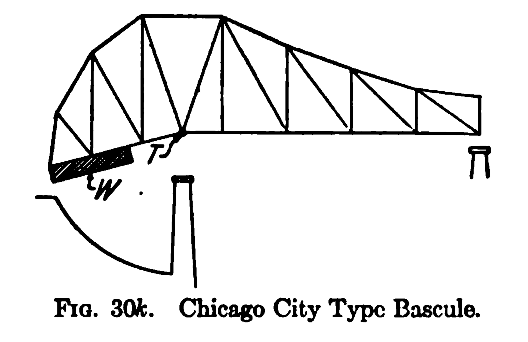 The above diagram appeared in the 1908 publication The Design of Highway Bridges and the Calculation of Stresses in Bridge Trusses by Milo S. Ketchum. We have revised some of the terms to reflect modern usage. Most of the following truss designs are adapted from those which appeared in J.A.L. 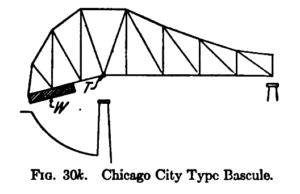 Waddell’s 1916 book Bridge Engineering and for the most part they remain relevant today with only minor name and classification changes as noted below. 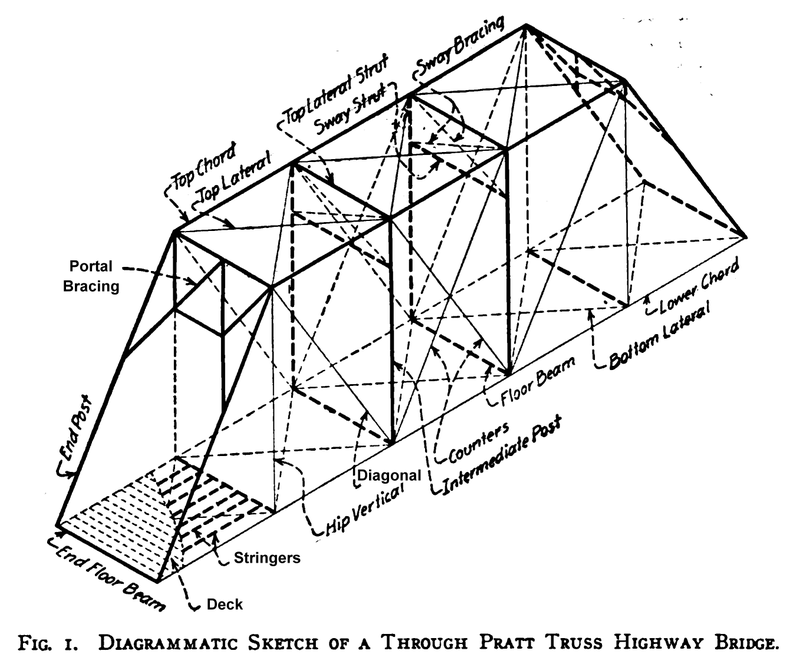 Pratt: The Pratt truss is one of the most common truss configurations. Pratt Half-Hip: Some Pratt pony truss bridges lack hip vertical members, and are known as half-hip Pratt truss bridges. Whipple (Double-Intersection Pratt): This variation on the Pratt was common for longer spans in the 19th Century. Howe: Diagonals follow the opposite orientation as that of the Pratt. The Pratt was more common on metal truss, while the Howe was more common on timber trusses. 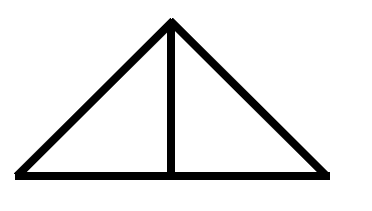 Parker: A Pratt truss with a polygonal top chord. Used for longer spans. Camelback: A Parker truss with exactly five slopes to the top chord (including end posts). Baltimore Truss: A Pratt truss with subdivided panels. Two common forms shown above. Pennsylvania (Petit) Truss: A Parker truss with subdivided panels. Two common forms shown above. Today, Pennsylvania truss bridges with five slopes of the top chord are usually called simply “Pennsylvania” trusses, but could be noted as “Camelback Pennsylvania trusses.” Pennsylvania trusses were used for long spans, including some of the longest simple spans ever constructed. Warren: While Waddell’s book distinguished between a “Triangular” and “Warren” type of truss, today all varieties are known as Warren truss bridges. Warren (With Verticals): Most Warren truss bridges display vertical members, although the frequency of the verticals can vary. Warren trusses (with or without verticals) were a common truss type. Double-Intersection Warren: This design can be thought of as two Warren trusses superimposed and offset on top of each other. K-Truss: Invented during the construction of the Quebec Bridge, the K-Truss can be arranged in several different ways, with two orientations shown above. The top chord does not have to be polygonal. Bollman: An unusual truss design used on some of the earliest iron railroad bridges. Fink: An unusual truss design used on some of the earliest iron railroad bridges. Bowstring (Parabolic): This form of truss typically has a curved top chord and is sometimes called an “arch-truss” as well. Most commonly used in the 1870s as an early metal truss form. Kingpost: Used for very short spans. Queenpost: Used for very short spans. May or may not have the “X” pattern of diagonals in the center. Waddell “A” Truss: This truss, sometimes called an A-Frame truss, was built in small quantities. Lenticular: Most examples in the United States were built to a patented design by the Berlin Iron Bridge Company of East Berlin, Connecticut. Kellogg: An archaic and rare truss form. Post: An archaic and rare truss form. Pegram: An archaic and rare truss form. Thacher: An archaic and rare truss form. Exact form may vary slightly, no existing examples exactly follow the design patented by Edwin Thacher. Stearns: An archaic and rare truss form. Among movable bridge types, bascule bridges display the most variety in mechanical operation. The following bascule designs are adapted from those which appeared in J.A.L. Waddell’s 1916 book Bridge Engineering and for the most part they remain relevant today with only minor name and classification changes as noted below. Fixed-Trunnion (Chicago Type): The counterweight is fixed to the leaf, and the leaf rotates around a fixed trunnion. First used in London’s Tower Bridge, the design was modernized and made popular by the City of Chicago. 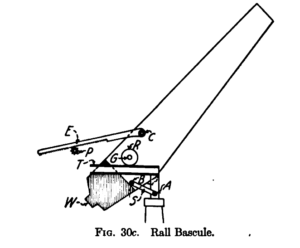 Scherzer Rolling Lift: This type of bascule rotates on a track, and has a counterweight fixed to the leaf. Invented in 1893 by Albert Scherzer and popularized by his brother William Scherzer. 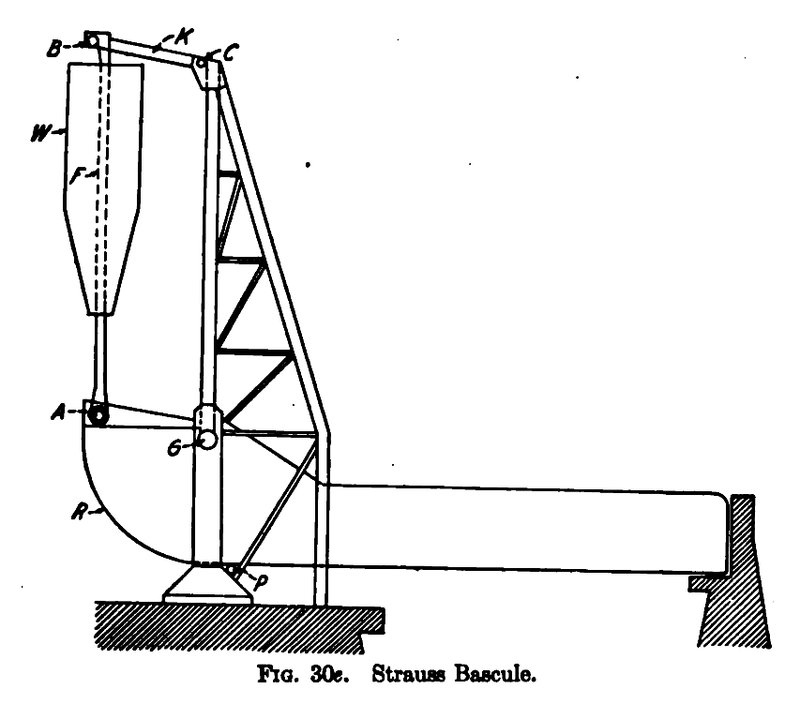 Strauss Bascule: Joseph Strauss invented his variety of trunnion bascule bridge that is noted for having a separate trunnion for the counterweight. As such, the counterweight is not fixed to the leaf. This overhead counterweight design was also adaptable to a design where the counterweight was hidden below the roadway. 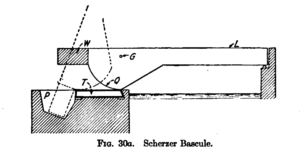 Heel-Trunnion: This variation on the Strauss bascule is noted for its parallelogram shape and typically takes the form seen above. The counterweight is always above the roadway. Page: A rare bascule design. 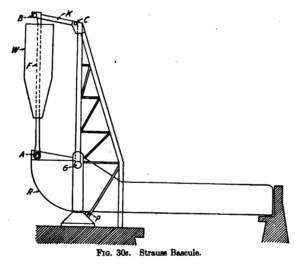 Rall: A rare bascule design. A movable bridge type, swing bridges are typically classified into two major categories based upon how they rest on the swing pier as noted below. Most swing bridges are symmetrical (center pier) but if the pier is not at the center, then the bridge is a bobtail swing bridge and a balancing counterweight may be present at the shorter end. Rim Bearing: Span bears upon the circular track around the rim. Typically has a dense series of numerous rollers around the rim. Center Bearing: Span bears upon a single point at the center of the swing pier. As such, there may be less rollers around the rim as they only serve to guide the truss when moving, and are not load-bearing.